For the past several months the cryptocurrency community has been discussing the IMMO reserve cryptocurrency project. 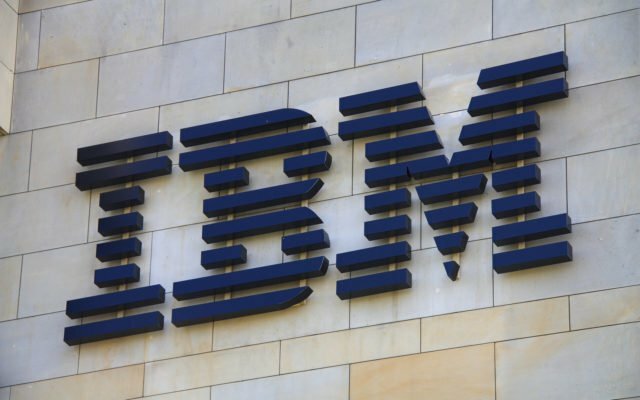 At different times, in one or another way IMMO topics involving influential personalities as Vitalik Buterin, Lon Wong, Jimmy Song, Tim Draper, Simon Cocking and other experts were coming out. According to some media reports, some of the employees of G20 financial ministries are also monitoring the development of IMMO. As it became known from the published document, the main governing body of IMMO will be High1000. High1000 will vote for certain changes in IMMO, being the guarantor of the rights of all investors in the project. Members of this community will receive bonuses depending on their level of involvement and awareness of the project. But it is not so easy to get into High1000, as only existing members can process and approve incoming applications and this is possible only if certain criteria are met. Is this community not available for ordinary mortals of the cryptocurrency world? Or High1000’s role in the concept of IMMO has inflated and the authority of its members is exaggerated? I’m going to find out answers to those questions empirically, by going through all the procedures that are prerequisite to join and get a certain rank within the High1000. It was not too difficult to find at least some traces leading to IMMO. Even prior to my research, a company called IMMO.FOUNDATION with headquarters in Prague, Czech Republic, could be found on LinkedIn. The company description contained a link that leads to a website where an application for the High1000 membership can be submitted. Question 4: Never before have I thought that I have done something great for the cryptocurrency market: can my articles published in various crypto-media be perceived as an achievement? Subjectively. In addition to people unfamiliar with the details of the project, there are probably those who decide to leave the platform without requesting to join the High1000 after reading the official documents of IMMO. I, the crypto-noob, am acquainted only with the information that has leaked into the public domain. Question 5: The most mysterious project asks me if I am familiar with the details of their mystery. At first I thought it was a joke. The sixth question was the first ray of hope in this questionnaire. As it turned out, one can join the High1000 only through experts and evangelists that are already part of the team. Perhaps as a major investor or a popular opinion leader, you can book a place in the IMMO community. Even if you do not fit into any of the mentioned categories, you can offer a unique contribution to the project and explain what is it that you can contribute with by ticking the line “Other”. Question 6: it turns out that there are several roles of High1000 participants: Investor, Influencer, Advisor and PR. 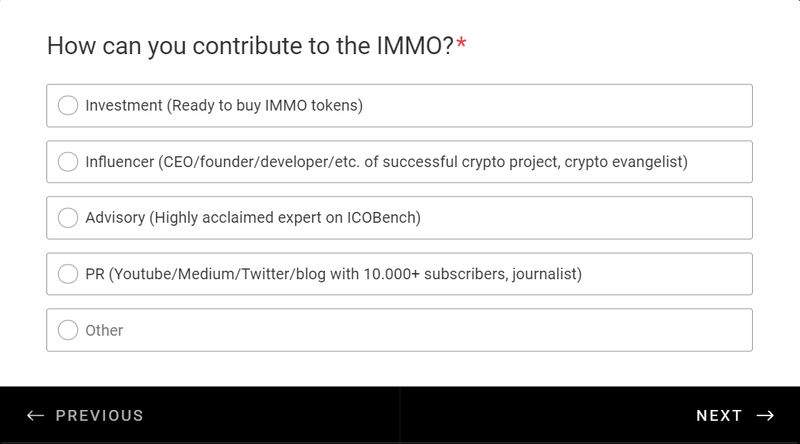 It is logical to assume that your chances of acceptance in the IMMO High1000 increase if you are recommended by one of the currently existing members. Unfortunately, I do not know any of them personally. Question 8: in the crypto-community, everyone knows each other, and if you do not know any of the members of the High1000-you are an outsider. Eight and a half hours after I finished filling out the application form, I received an email from high1000@immo.foundation. I was offered to read the official documents: IMMO Essence and IMMO Code. It is noteworthy that IMMO uses the unusual terminology of Essence, Code, and Manifest for the name of its documents. IMMO Essence – what is called a One-Pager. This document turned out to be the source of information that was leaked last month. 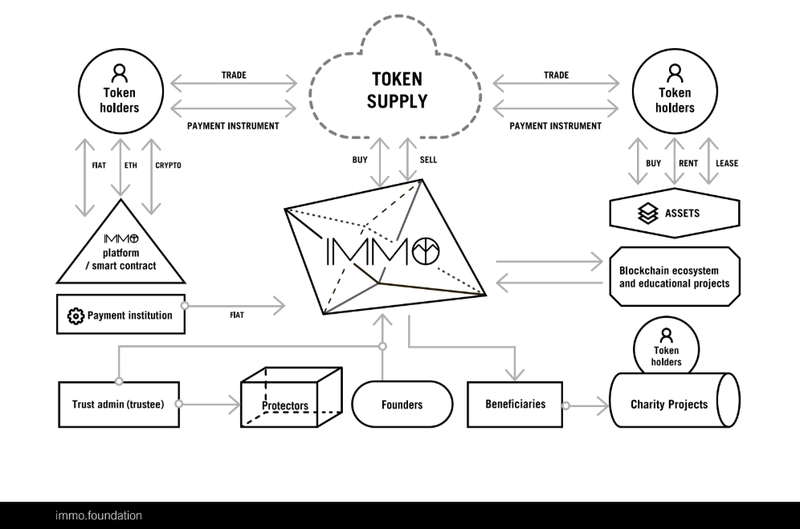 But only this time, significantly more information has been revealed to me: 4 pages of the document describe the key features of IMMO, its legal structure, the tokenomics, and the High1000 community overall. “World reserve cryptocurrency secured by intrinsic values” – this inscription is located at the bottom of the first sheet. Here yet one more remarkable fact: “legally backed by Deloitte”. The information that opens the second page of the document is a direct confirmation of recent rumors that IMMO is basically a traditional system of fiduciary relations – trust. The third page of the document describes the IMMO token physics, and the fourth page is devoted to the IMMO High1000. In the section — High1000, I became aware of the fact that the base of thousands of participants would be transparent and publicly available. Participants will have the right to vote as well as the right to purchase a token in each distribution round at the best price. 10% of all emitted tokens will be airdropped solely across High1000 members. – Be the speaker at the largest crypto-conferences (Blockshow, Consensus, Devcon3 etc.)). – Adviser or the first person of technological, financial or crypto companies or start-ups preaching an innovative approach to business. – A large amount of followers across social networks. I was re-acquainted with the part of the High1000 Code, then had to identify a group I wish to belong to. Of course, it is logical one would target the Evangelists group. I had to prove and justify why do I wish to belong to this specific group. If I were in a crypto-party, the last question would be a lifeline to me: “do you have recommendations from existing members of High1000?” For example, as a young and very ambitious journalist who has just started achieving unprecedented heights, but is already familiar with a number of crypto-experts, I could get a place in High1000. But I’m not in the party, and I’m not recommended.